With the increasing demand for juicing, the market for juicers has expanded more than ever before. This has put many juicers in between you and your ideal juicer. And our task was to dismiss them one by one, until you’re the closest to your juicer. In this review we point out what they are, and how capable are they in extracting juice, cleaning up, lasting long, and more. Juicing is a healthy habit that never goes out of fashion. The minerals, vitamins and enzymes that are otherwise lost when cooked will directly be absorbed into our circulation system. But not all juicers are efficient in doing that, and most of the juicers we came across weren’t even worth a second glance. That’s why we believe this review will be helpful for anyone looking for one. Our long hours of research and tests have directly been poured into this and we’ve covered all the areas including juicing efficiency, speed, power, affordability, clean up, noise level and more. So read on and discover which juicer would be the one for you. If nothing but the best would do, look nowhere else, Omega J8006 is the one. It’s not easy to find a juicer without many dietary restrictions. If it can handle fruits, it may not do a good job with leafy greens. If it does both, it might lack somewhere else; maybe in quality or value. But Omega J8006 is none of that - it’s the closest thing to perfection we’ve seen.Currently, it’s the #1 Best Seller on Amazon and has been that way for a while. It’s a masticating juicer. Meaning, it’s slower and greater at retaining nutrients and fibres. Ideally, it processes at 80 RPM and produces hardly any heat. Juicing is done flawlessly, and you’d see the evidence when the pulp comes out bone dry. Another major reason for picking Omega J8006 as the best is its versatility. Not only does it juice everything from hard to soft fruits and veggies including wheatgrass, kale and cabbage, but also grinds items like coffee beans, flax seeds and flour. Moreover, you can use the nozzles provided to make an endless list of homemade pasta, nut butters and baby food. Though not whisper-quiet, it’s quiet enough to allow an uninterrupted conversation while standing right next to it. In terms of dissembling and cleaning the 4 parts, it could be done fairly easily in less than 2 minutes. The prep time is Omega J8006’s only gripe that most of us are happy to overlook. This is because the chute is relatively smaller and large produce will need some chopping. All in all, it goes without saying that this is the best juicer we’ve seen in a very long time. It’ll live up to your expectations, and prove to be a long-term investment with an equally long 15-year warranty. Chances are, you’ll settle in with this juicer from day one, and never look at another juicer again. Spend your hard-earned money on this one and have no regrets whatsoever. 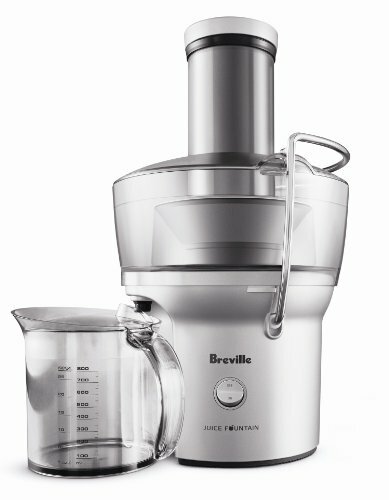 It’s hard to come by an efficient, durable and affordable centrifugal juicer like the Breville JE98XL. It doesn’t boast any optional features, and that’s how the manufacturers have been able to focus solely on perfecting the juicing process. It can run at 12,000 RPM and 6,500 RPM. This dual speed control can handle all kinds of fruits, vegetables and leafy greens. Even tough veggies like kale, celery and spinach will easily be shredded within seconds. The resulting pulp is fairly dry, which is common among centrifugal juices. But most of the time it is dry enough to save another trip through the juicer. What is worth highlighting, however, is its feeding chute. It’s 3 inches wide, possibly the widest in its category. This decreases the amount of chopping needed and as a result save you a lot of time. So if you’re always on the run, you’ll love its convenience. Because of Breville JE98XL power, it tends to vibrate more, and is considered to be somewhat noisy. But given how quick it is, the chances are, you may not even notice the noise! Cleaning is pretty easy as well and it comes with a cleaning brush. Just snap the parts off, and clean them after every use. To delight you beyond measure, the plastic parts come dishwasher-safe. Breville JE98XL is one of the top sellers for obvious reasons. All budgeters rush towards it like moths to a flame, and can’t be any more happier than they already are with their purchase. And we, hold nothing back in recommending this model. For the price, Hamilton Beach 67602A will not make you ask for more. Hamilton Beach 67602A is clearly not the best juicer available, which leaves you to wonder why we’ve still included it in our list. Well, our answer is pretty straightforward - this juicer is the farthest your money can go. It’s twice or thrice less expensive than similar units and of course, doesn’t boast many bells and whistles. But the core of this juicer lies in its prime function. It won’t say no to any fruit, veggie or leafy green you have in mind - even if it is something as hard as kale or soft as spinach. The pulp is surprisingly dry, which proves it has done a job well done. But there’s no juice cup included. It may frustrate you if you forget how many bucks you paid to get it. That said, it’s also important to remember that it isn’t the quietest model we’ve reviewed. Cleaning is fairly easy, and since it is dishwasher safe, you need not to overly worry about cleaning. It’s advertised to have a wider chute called the Big Mouth. Though not the widest, it’ll bring down the need to chop significantly. The power is one of the factors we inspected closely. Given how well it handles fruits and veggies of any type, we had to conclude that its 800-watt motor is indeed powerful. Though most of the parts are made up of plastic, they’re ABS certified. So it’ll set your durability-worries at ease. 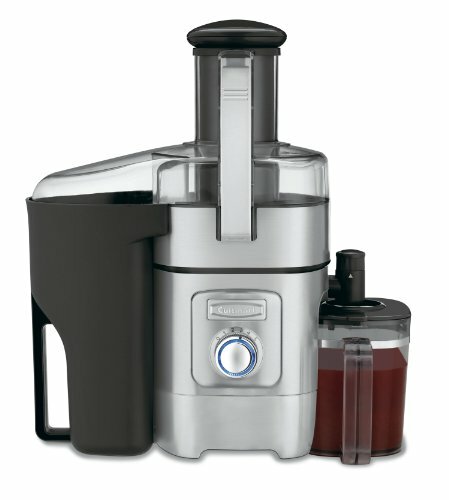 If you’re a complete beginner to the art of juicing, then Hamilton Beach 67602A would make an ideal buy. Everything from the efficiency to cleaning and the price is entry level, yet leaves nothing much to complain. All things considered, we believe that the value derived from this unit is not worth missing. then Breville BJE200XL is all that and then some. In a few words, Breville BJE200XL is a time saver. At 14,000 RPM, it not only is the fastest model just under $100, but also the model with the widest 3-inch feeding chute. In simpler terms, you can easily send a full apple down, which will then be turned into juice in less than mere 3 seconds! Don’t fret - an apple is only an example. It can do so much more with any type of fruit or veggie, both soft and hard. The juice extracted is of minimum froth, and the slower you go, the more nutrients you preserve. The pulp comes out fairly dry. And once again, if you go slow, there’s no need to juice it again. Cleaning Breville BJE200XL isn’t a big deal either. The snap locking mechanism makes dissembling the parts a piece of cake and you can send them right on to the first shelf of your dishwasher. However, the cover of the juicer is quite high and may not fit the first rack. Though not the quietest, we believe that the juicing noise will not leave your kitchen. It weighs just 11 pounds, so don’t expect all components to be stainless steel. The cutting disk is strong, and the design is patented so you won’t find it in any other model. And the provided juice cup - nay jug - can hold nearly 3 glasses of juice. It’s also transparent, with a clear quantity indicator. If this top brand is any indication, you’ll know that this juicer is made to please. Among the many advantages of Breville 800JEXL is its build quality. Most of its parts are stainless steel, which makes it heavier and sturdier. It has a unique extracting process in which the feeding chute is positioned right on top of the shredding disc. This helps the unit perform exceptionally well, leaving no space for doubts regarding quality and performance. For soft and hard produce, the juicer will automatically switch between the two available speed levels. The resulting pulp is often bone dry. But the pulps of juicy veggies such as tomatoes may seem wet, yet be rest assured that the maximum has already been taken. If you still decide to run it through the processor again, you’ll notice that it’s only worth a drop or two. The feeding chute adds even more value to the already valuable juicer. It is 3 inches wide ; enough room to accommodate two or more items at once and large items with minimum chopping. However, the entire unit measures up to 17 x 11 x 20 inches. So if you decide to buy this little warrior, make sure there’s enough space on your countertop. Evidently, the combination of power and speed tend to vibrate Breville 800JEXL. This might result in an audible noise, but considering how quick it is with the task at hand, you will not have enough time to notice any of this. Since almost no heat is produced by this juicer, the final output is rich in nutrients and fibre. After you enjoy the healthy juice, dismantle the parts and put them on your dish washer. If you decide to wash them by hand, go ahead, it’s made easier with the provided cleaning brush. Through a financial standpoint, Breville 800JEXL could be considered cheap as it’s an investment that’ll last for long years of heavy use. So far, no centrifugal juicer has even come closer to the level of value users derive from this. That’s why we crown it as the best centrifugal juicer on the market. Go slow and save more with BLACK+DECKER JE2200B. This inexpensive little juicer has so much to offer than many high priced models. That said, you need to be aware of what you’ll be buying beforehand. Black & Decker JE2200B is compact and small, which is a good thing as it saves a lot of countertop space. But on the downside, the feeding chute is also small. It measures around 1.25 x 2 inches. So everything that goes inside will have to be chopped into chunks, lengthening the prep time. However, what actually matters is how it handles what you feed it with, isn’t it? The good news is that it can handle almost all fruits and veggies that occupy an average kitchen including kale, celery and yams. But mind you, for best results, the unit will put your patience to test. So don’t force large volumes of produce all at once - send one piece at a time. This will allow you to enjoy a finest quality juice with a drier pulp. Better still, the whole process is done way quieter than many units we’ve tested. So peace lovers, you’d love this addition to your kitchen. Cleaning the juicer after every use is easy and all parts, except the strainer would need only a rinse or two. Use a cleaning brush or a tooth brush to clean the strainer off the remnants. However, this chore could be made even more easier if you use the top shelf of your dishwasher. The two-year warranty of Black &﻿﻿ Decker JE2200﻿﻿B speaks for itself. It’s reasonable to worry about the durability of a unit as cheap as this, but many have used it longer than the warranty period without having to repair it even once. All things considered, we’d recommend Black & Decker JE2200B more for loners and couples and less for families. With light to medium use, it’ll survive up to many years than the price suggests. Take Breville 800CPXL to your citrus garden and juice everything that catches your eye. Breville 800CPXL is the definition for efficiency, quality and convenience. One might initially think that it’s pricey, but when you take its overall performance into account, it is anything but pricey. To start off with, have a close look at the design. Not only is it uniquely beautiful, but also well thought out. You no longer have to press citrus hard after you place it on the cone. The juicer has a patented active arm system to take over your efforts. All you need is to finger-press the arm, and the rest will be taken care of. 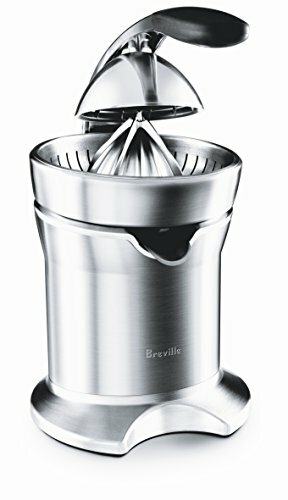 Another major selling point of Breville 800CPXL is its patented Quadra-Fin juicing cone. None of the other models can even come closer to the way its designed as it can juice down any citrus regardless of the size, including pomello. Even better, it is very, very quiet. The feature available to adjust the pulp to your liking is nice - you can easily make a sweetened juice with a light touch of sour pulp. However, the provided juice cup may not be the ideal size if you juice for many people at once. If you’re a person who doesn’t like cleaning, then you’d be delighted to hear how safe are the parts to be washed in a dishwasher. That doesn’t mean washing it by hand is any less easy - just rinse the parts out and use a brush to get the strainer cleaned. This way, it’ll be good to go the next day. All things considered, we’d recommend Breville 800CPXL more for loners and couples and less for families. With light to medium use, it’ll survive up to many years than the price suggests. It’s okay to be thrifty as long as you have this juicer. If you’re overlooking the best citrus juicer in our list, we think it’s safe to assume that the price is the reason. If so, the CJ625 model from Black and Decker will make a worthy and affordable substitute. It comes with one small and one large cone and they fit almost all average-sized lemons, oranges, grapefruit and more. Once you press the fruit on top of the cone, it will swivel in a way it sees fit in order to get the most out of the juice. Although loud, this is an excellent addition to minimize wastage. The resulting juice is seedless and tastes sweeter. With the pulp control, you can easily decide the desired level of pulp to be included in the juice. If you do adjust it to include a little bit of pulp, the good news is that the seeds will still stay out of the way. 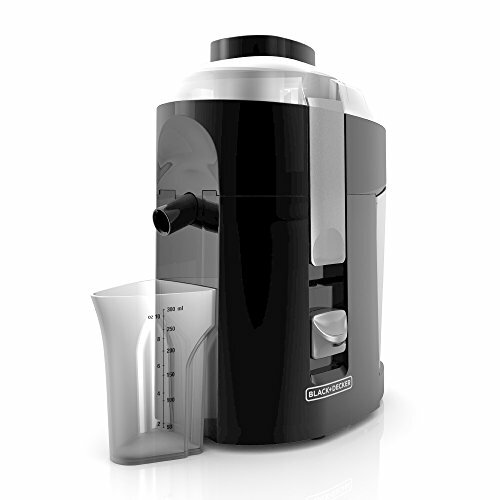 The juice container is one of the many reasons for giving Black & Decker CJ625 a ‘thumbs up.’ It comes with a clear capacity indicator and can hold up to 34 ounces of juice.Though this means you can continue juicing without having to empty it often, continuous use for large batches of citrus tend to heat up the juicer. So our advice would be to go slow. After all, there’s only so much an inexpensive juicer could do. Cleaning the juicer up is convenient - possibly the most convenient of all. All you need is to just rinse the reamer and the juice cup, which will need only a minute of your time. If you keep in mind that you’ll be paying an amount like your pocket money to get this, you can escape any disappointment regarding the quality or durability. However, its performance makes it easily stand out from the rest. Epica is epic because it’s made to last longer than what you pay for. 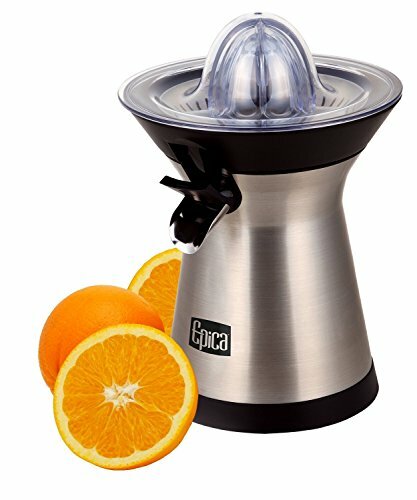 Epica Powerful juicer is one of the highly rated citrus juicers on Amazon. It is everything the manufacturers advertise it to be and anyone from a seasonal to a regular juicer can equally love it. Epica’s power is what makes it so easy to use. With two reamer sizes to choose from, there’s no citrus fruit this beast will refuse. Just cut it in half and place it on top. With barely any force, the juicer will set to work. It only needs a few seconds to go from one fruit to another. Better still, it’s whisper-quiet. You don’t have to wait until the entire household wakes up to run the juicer every morning. Cleaning is another bonus, it needs nothing but a simple rinse to wash it clean. Build quality is pretty good too. Instead of cheap plastic, the body is made up of stainless steel. So there’s no danger in expecting it to last for a couple of years. And the design is pleasing to the eye, which means it doesn’t have to be hidden away from the sight when not in use. However, like almost every other juicer in this price range, Epica tends to overheat if ran continuously. Overheating will automatically shut the machine off for sometime. This can be avoided by allowing the machine to cool down when it shows signs of heating up. Once it has cooled down, which takes only a few minutes, you can continue juicing again. After all, for the price, it’s a flaw most buyers are happy to forget and move on. If you’ve been struggling with a manual citrus juicer, then it is high time you replace it with an electronic juicer like Epica. We won’t be surprised if you say the difference is like night and day. A high-end product for health-conscious juicers. 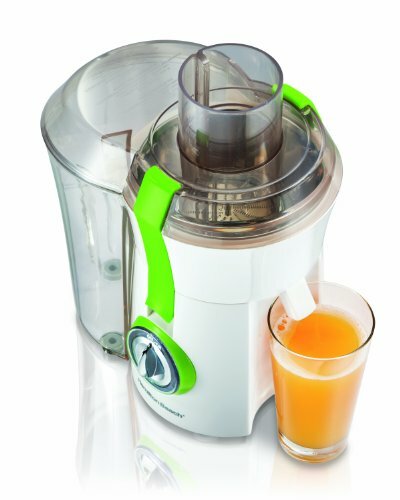 Tribest is the latest multifunctional model of Green Star juicers and by far the best as well. The core of this juicer lies in its juicing efficiency. It is unlike any other juicer we’ve seen because its Twin Gear Press is capable of saving more than triple the essential minerals saved by an ordinary juicer. Tribest take over your juicing needs by sending it through an extensive 3-staged process from crushing to mixing and pressing. This ensures you receive the highest possible yield. If the initial cost gets you thinking, then imagine how much you get to save over the years with a bone dry pulp. And of course, the savings on your health shouldn’t be forgotten too. Versatility is another major reason why we’ve rated this model high. It comes with 4 different screens and the 5th one, which is a pasta maker set, could be purchased separately. You can not only juice, but also process basic food, and make items like raw breadsticks and rice cakes with the given 4 screens. As far as cleaning goes, it’s easy. Don’t expect it to be a 1-minute job because this is no ordinary juicer. The screener may consume some time as it needs some additional brushing. Tribest’s noise insulation is at a satisfactory level and you won’t want its sleek design anywhere else than on your countertop. The 12-year warranty boasts how confident the manufacturers are about their product. So if there was any question about the reliability of this Apple iPhone of juicers, then the warranty will set your mind at ease. If you’re health conscious to the bone, then Tribest Green Star Elite will make a perfect fit. It saves the most out of what you juice, and there isn’t another juicer that promises the same. Have a real lot to juice? Then let the Champion handle it like a champ. Commercial juicers are built different to a residential juicer because they need to sustain heavy and continuous use for a longer period of time. 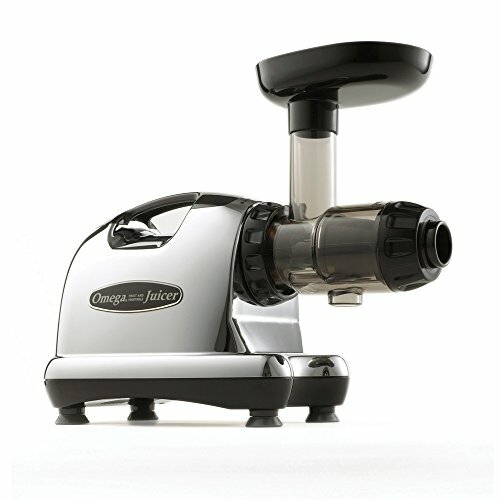 In our tests, Champion-Juicer-G5-PG710 scored the highest points in terms of durability, performance and versatility. Let’s start with durability. The weight is a good indicator that most of its components are anything but cheap plastic. The cutting blades are stainless steel, so it won’t wear, tear or give up easily. It’s also made in America, so you need not to worry about dealing with a manufacturer overseas. Though with limitations, the warranty is generous too. When it comes to performance, Champion is known to win hearts. But not with wheat grass as it isn’t really good at it. Once you press the pusher down with light pressure, most fruits and veggies will easily be juiced. However, naturally juicy items like tomatoes may give you a slightly wet pulp. There’s more to this champion and that’s another reason why this is in our list. In addition to the juicing screen, it has a blank screen which is capable of processing delicacies like nut butter, baby foods and sorbets. Cleaning is indeed super easy and will not waste your time. With no plastic components, all you’ll need is to rinse it under running water. However, don’t forget to soap and rinse it well at the end of the day. This way, you can lengthen its useful life. 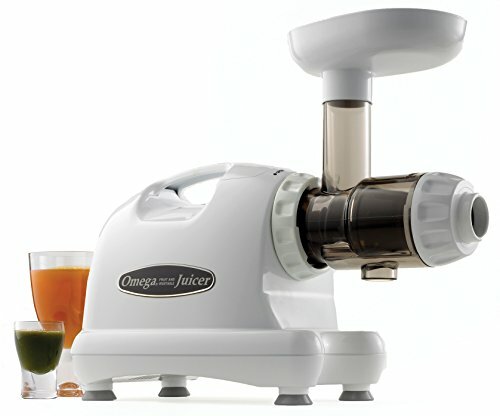 We recommend this Champion juicer for commercial purposes because of how well it is built. It can sustain heavy use and under proper care, will not fail you for long years. It’s not everyday you come across a juicer like this - period. Omega VRT350 is a top-rated, best-selling model for reasons that fingers can’t count. It scores big on areas like performance, and durability, but it scores the biggest on convenience of use. It is designed to stand like a tower, which saves a lot of countertop space. You can easily tuck it in a corner of your kitchen counter when not in use. This design also plays a big role in terms of convenience. You no longer have to ‘feed’ the produce one by one into the chute, just drop it in and the gravity would take care of the rest. Unlike other juicers we’ve seen, cleaning is child’s play. You don’t have to dissemble any part like you normally would. Just pour water into the juicer and it’ll wash itself clean. However, don’t forget to have it dishwasher-cleaned on and off. The self-cleaning feature available on the screen is another convenient feature that didn’t go unnoticed. This includes a plastic cover that wipes away residual pulp and seeds from the screen - preventing blockage and making room for more produce. As far as efficiency is concerned, Omega VRT350 does a job well done. Any produce, including something as tough as wheat grass will easily find its way through this beast. A slow process is expected, so you need to practice a little patience. However, it isn’t flawless - you may notice some foam on your juice. But a quick stir from a spoon will solve the issue in no time. Unlike other Omega models, VRT350 is more affordable. But what makes it a great buy is that the manufacturers haven’t compromised quality for the price. All things considered, we won’t hesitate recommending it to anyone. If you’re a peace keeper in an early-morning kitchen, then Cuisinart CJE-1000 is where you should start your search from. If you’re looking for a centrifugal juicer, then one obvious reason for your choice is the speed and power. 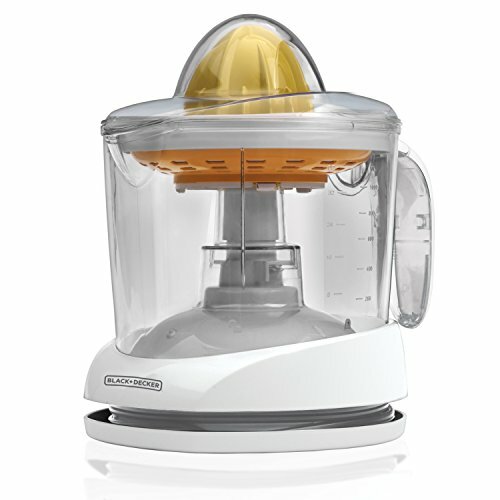 Not all centrifugal juicers are as powerful nor as affordable as the Cuisinart CJE-1000. 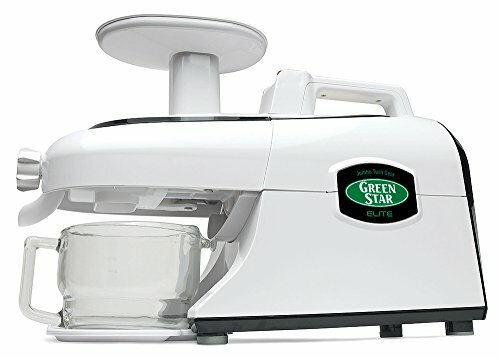 It has a 1000-watt motor and 5 speed levels to choose from so that you can go from hard to soft veggies and fruits without having to worry the least. The feeding chute is wide at 3 inches. But a small designer flaw demands the produce to be chopped into small chunks. This may lengthen the prep time, but you can easily catch up with the time wasted via the fast juicing and easy cleaning. The quality of juice isn’t the finest with a layer or two of foam, but it still tastes wonderfully good and the pulp comes out pretty dry. If you’re juicing with hopes of losing weight, the minimum loss of minerals and nutrients will ensure that you reach your goals fast. We admire how well the unit is made compared to other juicers within a similar price range. The body is not plastic but stainless steel. This makes it sturdy and durable. We also like how voluminous the 1 litre pitcher and 2 litre pulp collector are. They make you enjoy juicing in large amounts with hardly any interruption. Moreover, the quietness Cuisinart’s manufacturers have achieved is, quite frankly, hard to believe. There’s no user who hasn’t loved it wholeheartedly and we are pretty sure you will too. All things considered, Cuisinart CJE-1000 is a powerful yet quieter unit made to serve your kitchen for many years to come. It has received great customer ratings on Amazon too, which back all our claims. Easily beats competitive models within a similar price range. 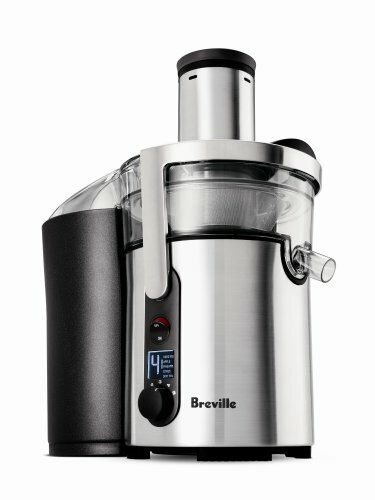 Juice extraction at one of the top-notch levels is provided by this Breville model BJE510XL. Though centrifugal, nutrients and minerals are not lost to heat and oxidation. This is because Breville BJE510XL adapts its own, patented Nutri Disc system. This system is powered by a 900-watt motor which blends and squeezes the produce so that no moisture is left behind. Depending on the hardness of the produce, the machine will automatically switch speeds and pick the ideal one among 5 speed levels. Though there’s no fruit or veggie this juicer would refuse, ultra soft and small produce such as raspberries have a tendency of ending up in the pulp basket even before a good amount of juice is extracted. However, you can avoid it by juicing them in large quantities or with a hard produce. As far is cleaning is concerned, it’s quite an easy task even for a beginner. There are in total about 6 parts to clean and they all only need a rinse except for the filter which will obviously need to be brushed - like in every other juicer. Breville manufacturers don’t give much thought to noise insulation and this model is no different. It isn’t as loud as to make you wear ear buds. But sounding more like a blender, it’ll assure you of its power. 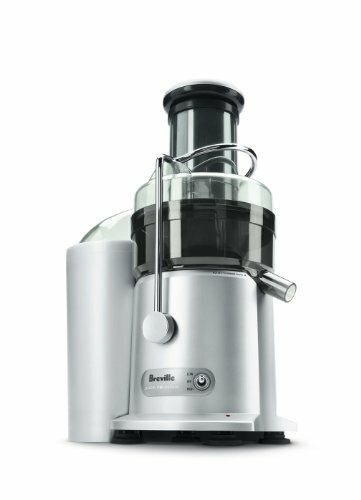 Breville BJE510XL is, without doubt, one of the best juicers we’ve reviewed. With 5 different speed levels, and a powerful motor, it extracts the most out of produce and stand way ahead than other centrifugal juicers in preserving essential minerals in your juice. Identical, yet younger to our top pick, lacks nothing when it comes to efficiency. 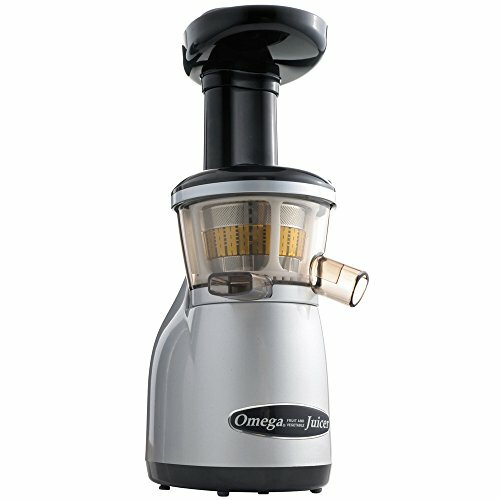 Affordably priced, Omega J8004 is a juicer that makes buyers want to repeat their purchase and gift it to their loved ones. At 80 RPM, it is slow. But since the best things in life are the results of patience, let the clock tick and wait for this juicer to bring the results it promises. With no froth and no heating, Omega J8004 saves the most out of the nutrients - very much like our top pick. There’s simply no fruit or veggie you can’t juice, even the pulp of leafy greens come out dry. But the chute isn’t as wide as Omega J8006. So you’ll need to allocate some prep time. The 3-day shelf life is a bonus for those who find the slow speed frustrating. You can juice in bulk and sip it in with hardly any nutritional loss. However, what never fails to surprise us is Omega J8004’s versatility. With all the extra attachments, nozzles and screens you can do so much more than simply juicing. Make your own, natural and nutritional nut butters, pasta, soy milk and more. You can also grind and mince coffee beans, nuts and herbs. In truth, staying healthy has never been easier. Cleaning the juicer up after every use is not a fine art. Anybody who knows their way around the kitchen will know what an easy task it is. The filters are the only parts that’ll need some brushing, and the rest will need only a rinse. Though not stainless steel, the body is made up of GE Ultem plastic. This is stronger and of quality. So apart from all the other benefits, you get a long life to keep with an equally long 15-year warranty. Lacking only a fraction of power and efficiency of our top pick Omega J8006, this unit will make an ideal buy for those on a budget. It is certainly not inexpensive, but considering everything it offers, it is anything but expensive. If you’re a complete beginner to the art of juicing, you have a lot to learn. But don’t fret. While most of those could be learnt through experience, our buying guide will help you get started in picking the right juicer. Following are the 3 major types of juicers on the market right now. Understanding what they are beforehand will help you make a better purchase decision. If you want to juice something in lightening speed, then you should start your search from centrifugal juicers. They’re known for their speed and are also called ‘high speed juicers.’ They grind the produce to turn it into a pulp and then juice it out. While the speed and the ability to grind even hard veggies are its biggest selling points, they’re noisier and cause more oxidization. As a result, the juice can only be store in the shelf for 24 hours. However, they’re not so good with leafy greens like wheatgrass. Because these types of juicers are slower, they’re called slow juicers. Unlike centrifugal juicers, they need two processes to turn the produce into juice. Firstly, the produce is crushed into fine particles. The juice is then squeezed out of the pulp. This process reduces oxidation and destroys less amount of fibre and nutrients. As a result, it provides an extended 72-hour shelf life. These juicers are famous for handling leafy greens as well. They come in both horizontal and vertical forms and they differ in aspects such as the feeding chute size, prep time and foot print. However, they’re generally more expensive than centrifugal juicers. Commonly known as twin gear juicers, the juice extraction process of triturating juicers has three stages. They first crush the produce and then squeeze it twice to extract the juice. If you have a lot of leafy green vegetables or wheatgrass to juice, then this juicer will make an ideal buy. However, their high efficiency makes them the most expensive of all. Ideally they’re double or triple the price of a masticating juicer. But they are slower, and save most of the fibres and nutrients of what they juice. Additionally, they can be used to make baby foods, peanut butter, sorbets, and even pasta and rice cake by using the many optional features offered. 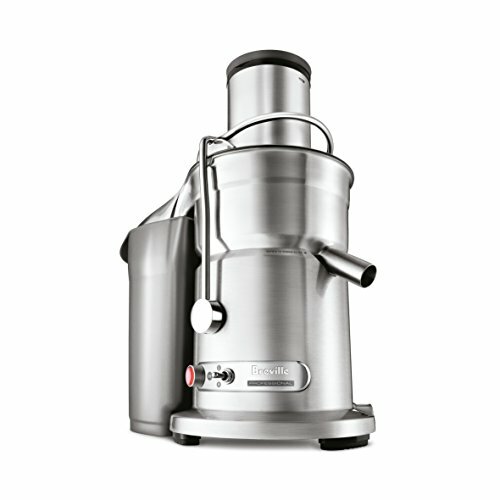 Like the name itself suggests, functional juicers are designed to serve only the juicing needs of a particular produce. They do not belong to any of the above 3 types. While there are both manual and electric juicers, Citrus and wheatgrass are the most common types of functional juicers. Ease of use should be your prime concern when choosing anything, and a juicer is no different. A juicer with minimum prep time is considered to be the easiest to use. Such juicers have a wide feeding chute ; the wider they are, the less chopping you’d have to do. Speed is another important factor that determines the ease of use. For your information, centrifugal juicers are faster than masticating. However, they’ll not be able to store the juice longer because by rotating faster, they generate more heat and cause more oxidation. But the sooner you sip the juices in, the better. So don’t let it stop you from buying the ideal juicer. Juicers are meant to save time, and that’s another reason why they’re always on a high demand. But some juicers are extremely difficult to clean, and cleaning them waste the time you save in juicing. So make sure your juicer has a pulp ejection system. If not, you are sure to detest cleaning. Horizontal auger machines need very little cleaning because they obviously have little parts to clean. In contrast, twin gear extractors with many parts will need more cleaning. However, there are models that allow you to use a dish washer for cleaning. On a scale of 1 to 10, we’ll say that the ease of cleaning is 9. Noise insulation plays an important role if there’s someone who doesn’t like to be disturbed every time the juicer runs. Some juicers are loud - loud enough to wake even your next door neighbour up. Some vibrate a lot, causing to intensify the noise. While at the same time, there are manufacturers who use modern soundproof technology to muffle the sound well. So pay attention to those before you buy. Budgeting your purchase makes things easier. Once you determine how much you’re going to spend, you can exclude the juicers that fall out of your budget. But as we always mention, don’t let the initial cost be the only reason that governs your choice. Consider the overall value and the cost of maintenance. Also, don’t buy a juicer with features you wouldn’t use and likely never use in the future. Every additional feature will cost a few more bucks. Shelf life depends on the type of juicer you pick. A centrifugal juicer has the shortest 24-hour shelf life. However, their speed of operation makes it easy to juice only when needed and removes the need to store juice for future use. On the other hand, a masticating juicer has an extended 72-hour shelf life. This is mainly because they are known to retain the quality of the produce better than centrifugal juicers. But no matter which juicer you choose, we always favour sipping fresh juice in. That’s the best way to get the most out of your juice. Most buyers fail to notice the warranty when they make a buy. That’s why we’ve taken the time to mention the obvious. If you’re opting for an expensive juicer, make sure you get a long warranty. For luxury items, warranty is an indication of quality and the manufacturer’s confident. Inexpensive items often come with a short warranty. This is because the manufacturers aren’t willing to cover more expenses related to your purchase. However, that doesn’t often indicate lack of quality. You need to look into your countertop space before you buy. Most juicers aren’t as large as to not fit on a countertop, but horizontal models tend to take up more space. The design is another point most buyers look into. But make sure you don’t sacrifice performance to please your eye. Even if the juicer lacks beauty, you can still hide it inside a cupboard. In order to determine the efficiency, you need to check the condition of the pulp that comes out of the juicer. A drier pulp means juice extraction is done at maximum. And vice versa. Whether you’re an experienced juicer or a complete beginner, we believe our review has helped. However, not all juicers are for everyone, and what is right in one’s taste may taste sour on your tongue. That’s why you need to be insightful and we have tried our best to give you that. After all, juicing is a habit we all should cultivate and nothing can beat its healthy benefits. You’ve taken the right step toward buying a juicer and perfect it by making the right purchase from our list.